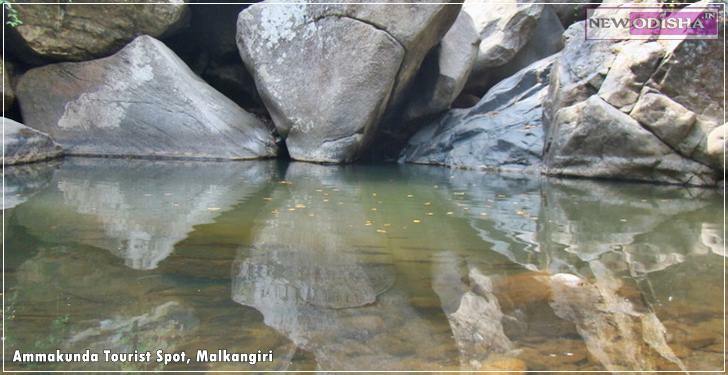 Ammakunda is one of the major tourist places in Malkangiri District. It is situated at Khoirput Block near about 70 Kms, from the District Headquarter. This cool place embraces a natural water fall and subsequent flow of water forming a narrow gorge. The fishes found in that gorge are quite friendly to the human being and are believed to be the form of Lord Vishnu in ” Matsya Avatar”. Fishing in that place is not practiced according to the belief of the local people as well as the visitors. Visitors can enjoy their stay at this place by feeding the fishes. This area is surrounded by dense forest and small hillocks. So this place is the main attraction for the people who loves the nature very much. Ammakunda tourist Spot is near about 50 KMs from District Headquarter. Tourists visiting Ammakunda have to pick the bus Services from Jeypore to Chitrakonda. They need to drop at Ammakunda. Give Responses for "Ammakunda Tourist Spot in Malkangiri of Odisha"